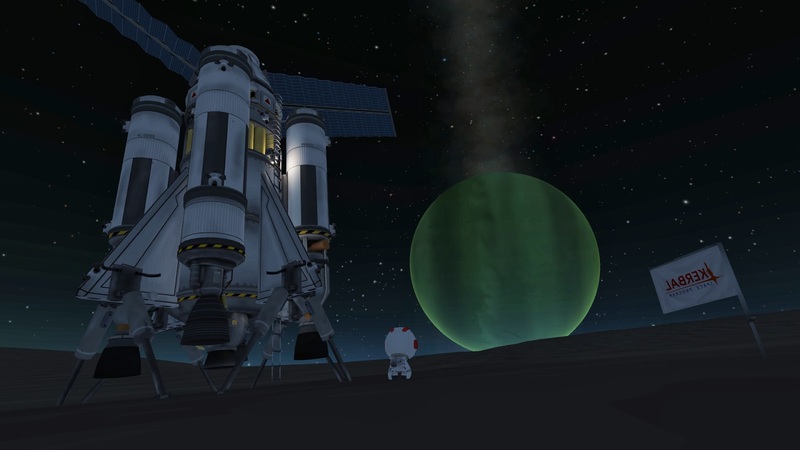 Shane Colton: KSP: Mission to Laythe (and back). 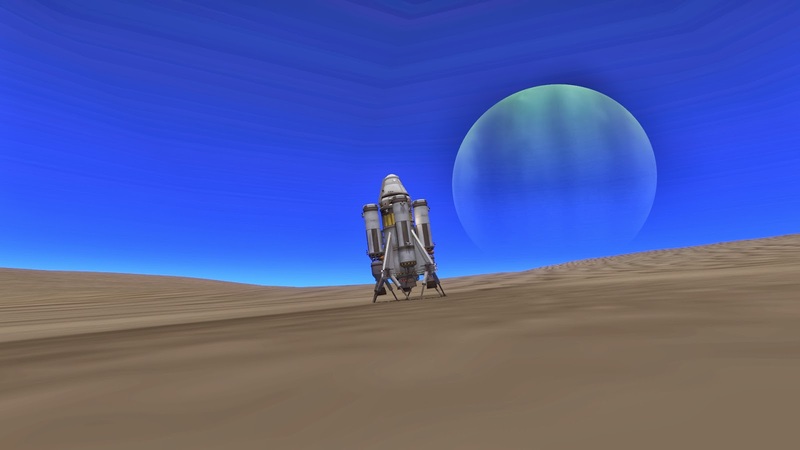 KSP: Mission to Laythe (and back). 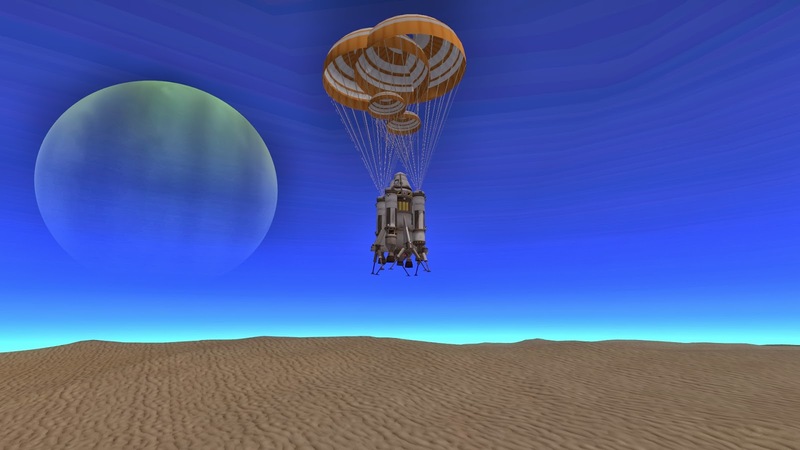 A single ship would not be able to carry enough fuel to land on Laythe and return. In fact, I determined that even getting from the surface of Laythe back into orbit would require almost all the fuel the lander can carry. In order to have fuel for the journey itself, two ships would have to go. 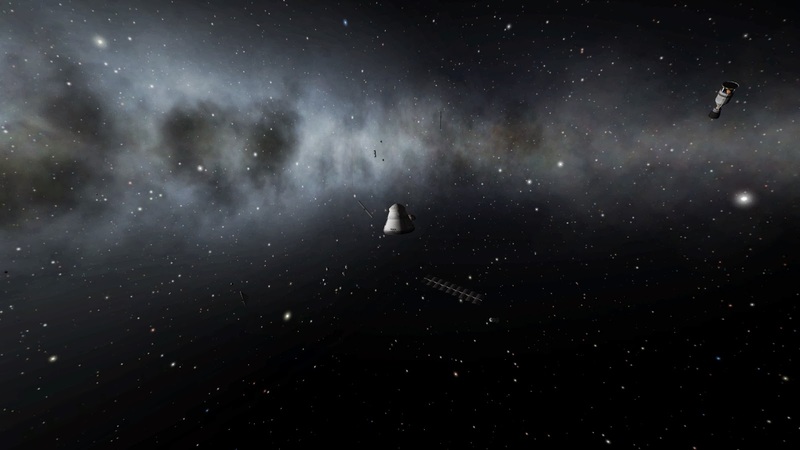 And each of those ships would need to be completely refueled in Kerbin orbit (by two more ships) before heading off. 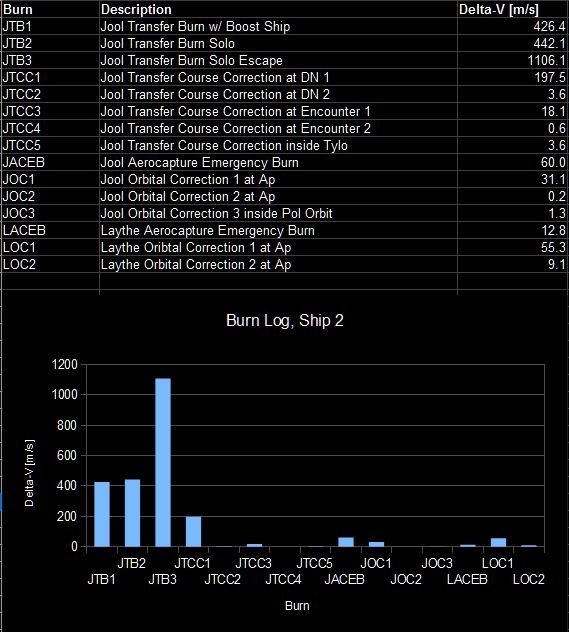 So, the mission as a whole required four ships (twelve crew) and four orbital rendezvous. Basically, lots of docking practice. 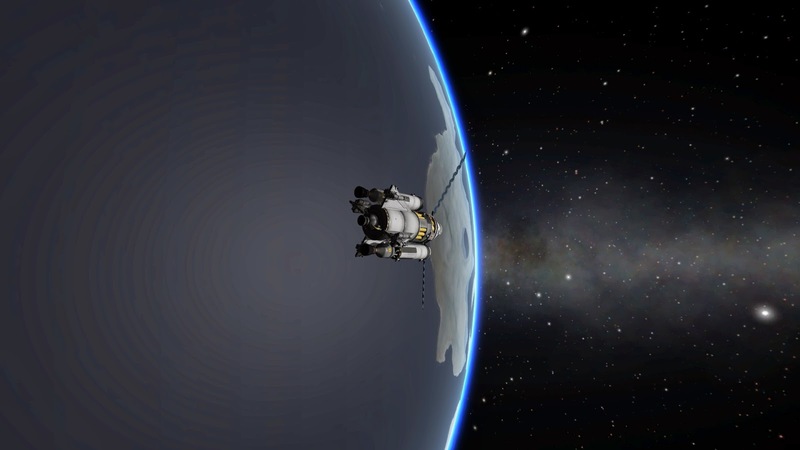 One of two Kerbin Orbit Rendezvous. 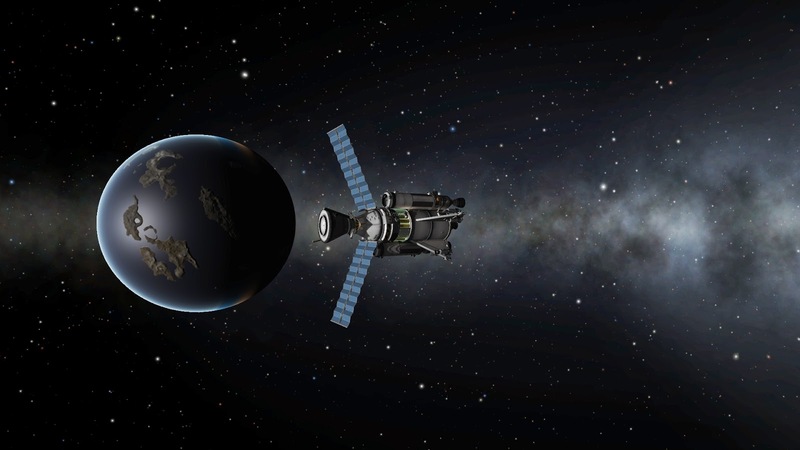 Docking and refueling in Kerbin orbit is somewhat routine, so I'll skip that part and focus on the bulk of the mission, which really has four parts: 1) Kerbin to Laythe, 2) Laythe Landing, 3) Laythe Ascent, and 4) Laythe to Kerbin. I've only successfully managed to even get to Laythe once before. Other attempts have been cut short by ship-eating game glitches such as the Deep Space Kraken. This time, I made sure to use quicksaves and also back-up persistent saves so I wouldn't be screwed if my ships randomly blow up in deep space. 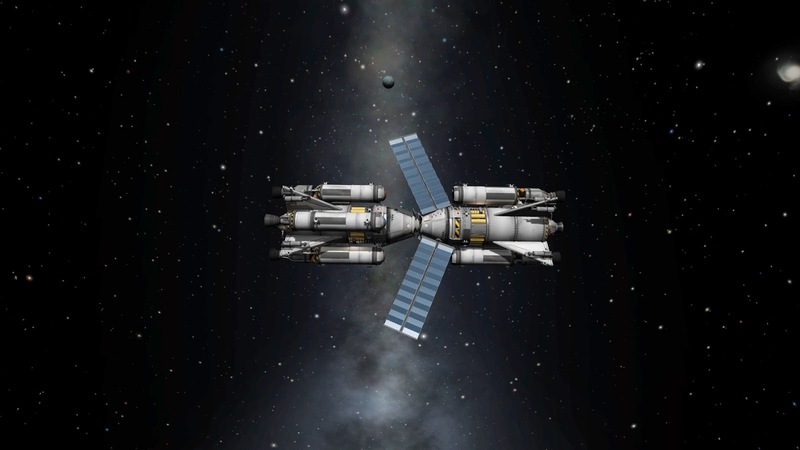 Both of my fully-fueled mission ships managed the transfer with a Delta-V of about 1975m/s, almost perfect. 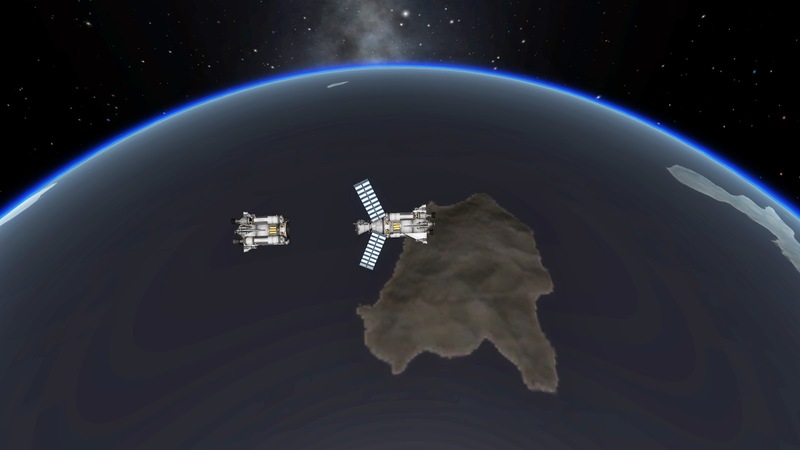 (Part of the burn was done using the refueling ship to boost its docked fuelee into a more energetic Kerbin orbit. 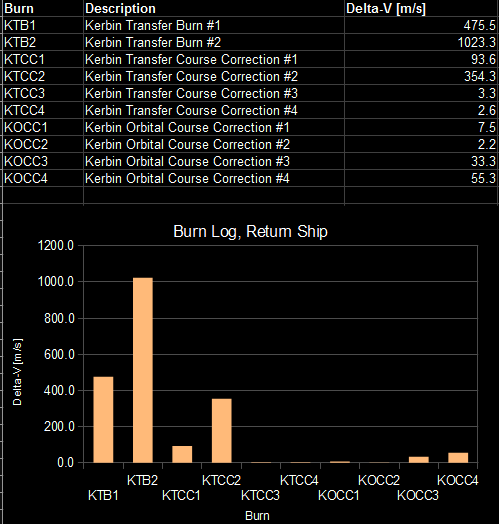 The fully-fueled ship would then detach and finish the transfer burn on its own in subsequent orbits.) 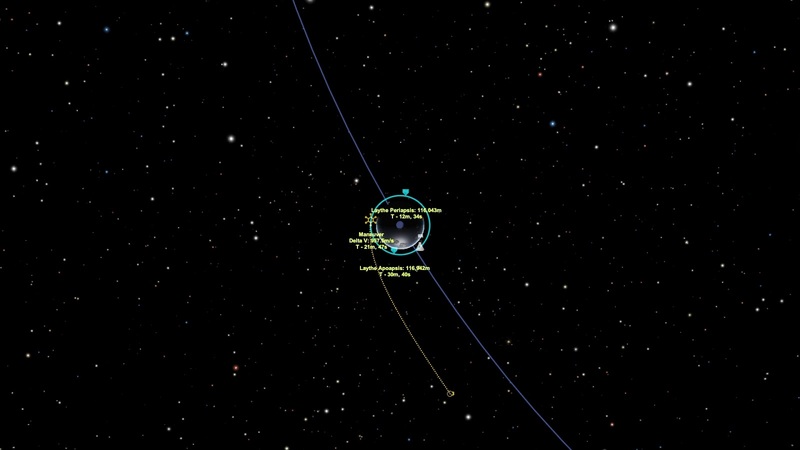 Later in the transfer, some smaller course correction burns add a bit more to the total Delta-V required to get to Jool. 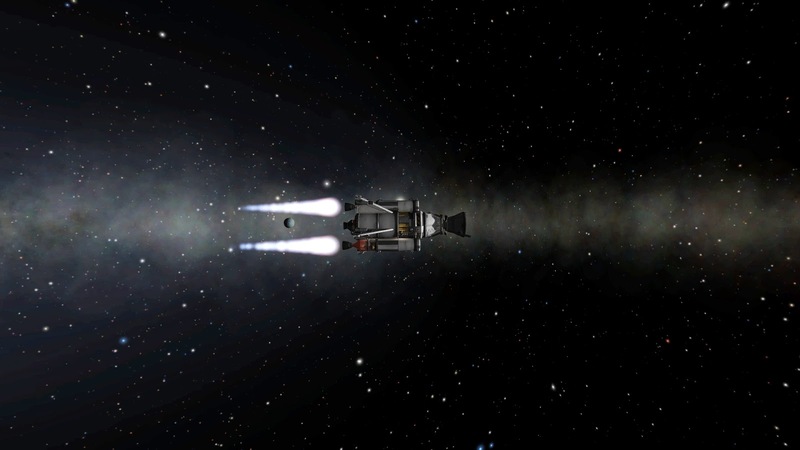 But ideally, once a Jool encounter is achieved, very little additional fuel should be necessary to slow down, get captured by Jool, and ultimately, transfer into a Laythe orbit. 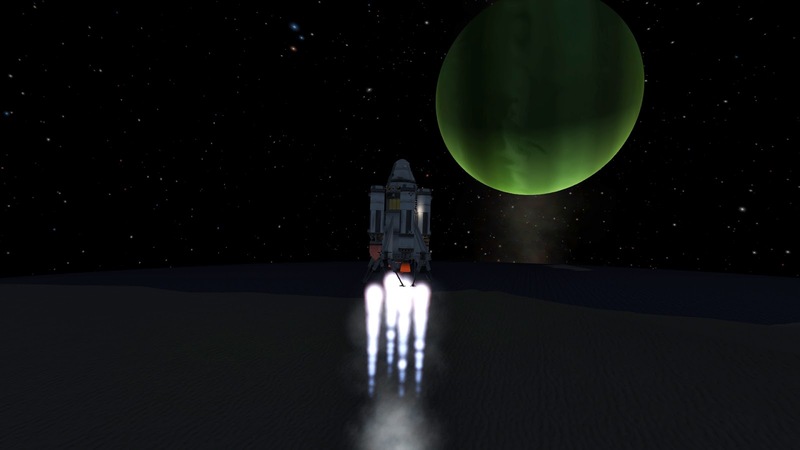 Since both Jool and Laythe have atmosphere, this can mostly be done with well-targeted aerobraking. Lucky Tylo slingshot. Remember kids: always aerobrake in the counter-clockwise direction. 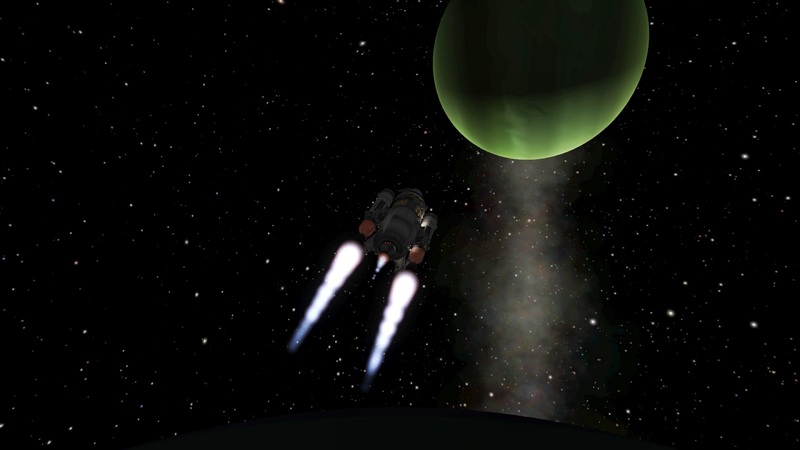 I tried a couple different techniques for aerocapture and aerobraking: using Jool's atmosphere to slow down into a less energetic Jool orbit and using Laythe's atmosphere for a direct aerocapture into Laythe orbit. 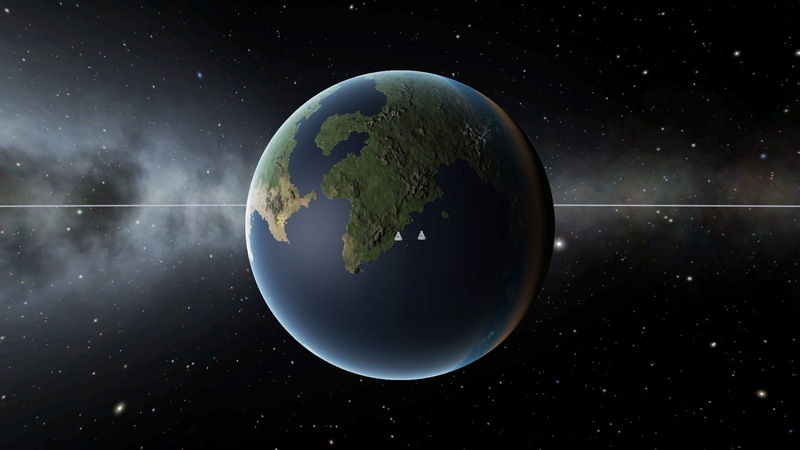 Which is better depends a lot on the direction of Laythe in its orbit relative to yours: if nearly parallel, less energy is required to aerocapture and it could be a good opportunity to do so. If you are approaching Laythe at a right angle, it might be better to wait for a better opportunity and aerobrake more at Jool instead. 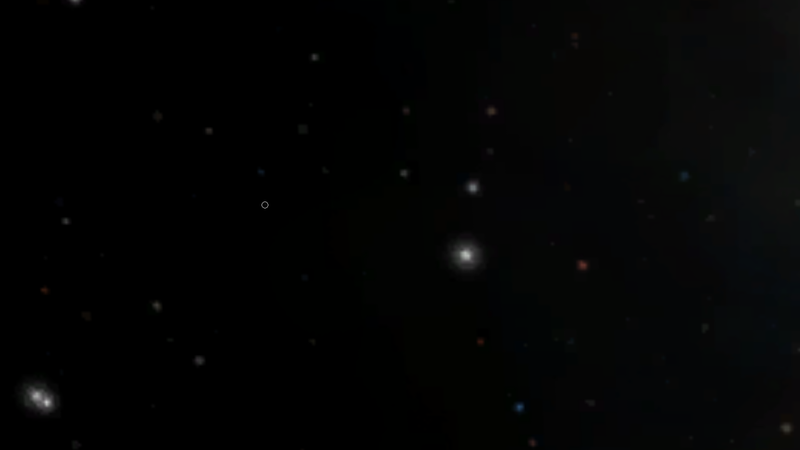 In either case, it's important to always approach Jool in the correct orbital direction (counter-clockwise, viewed from above) so that you're not setting yourself up for a head-on Laythe collision. 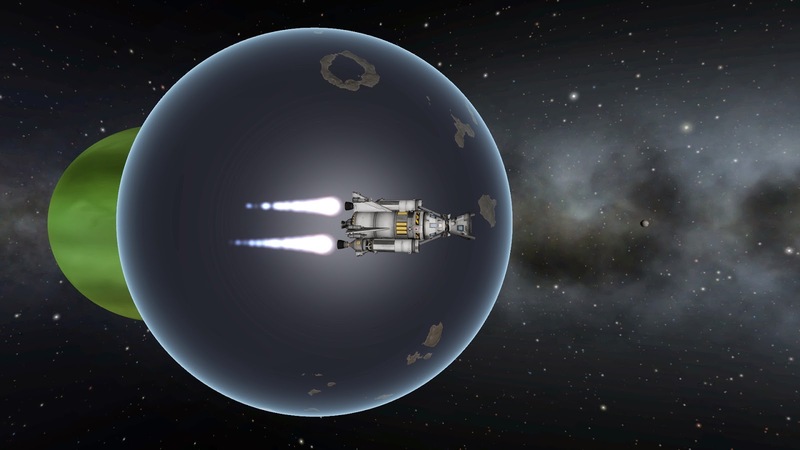 Ship #1, aerobraking away from Jool "set". Ship #2, aerobraking into Jool "rise". 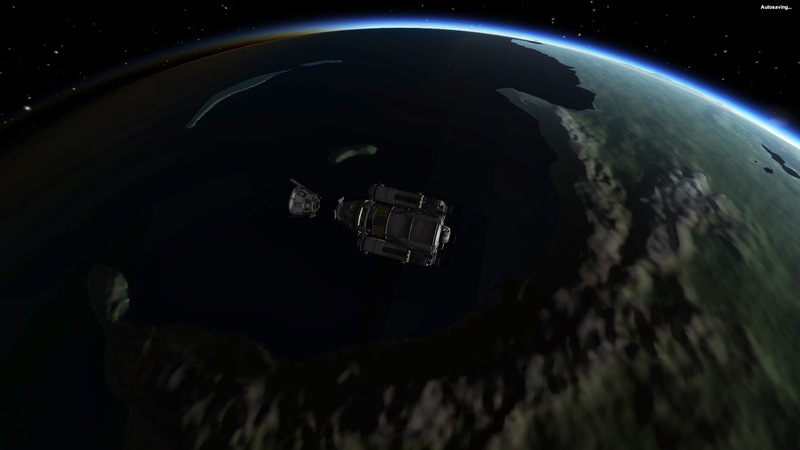 Once the ships had both arrived in low Laythe orbit, it was time for the third rendezvous of the mission (the first between these two ships) in order to refuel the one that would become the lander. 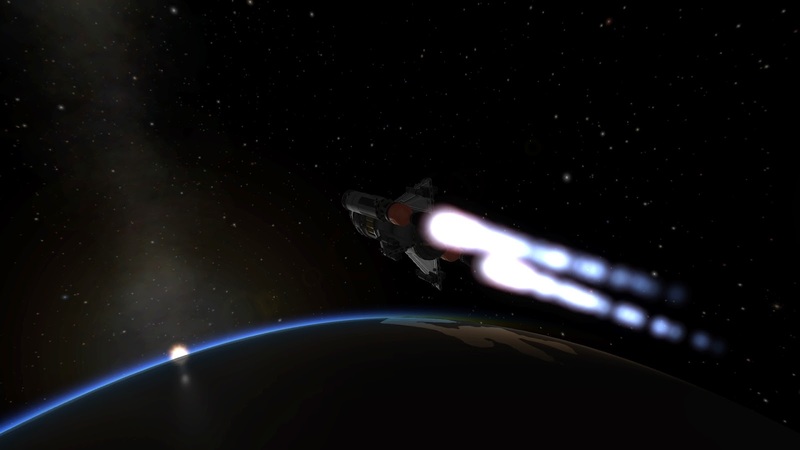 The second ship stays in orbit around Laythe and retains just enough fuel for the return trip to Kerbin. 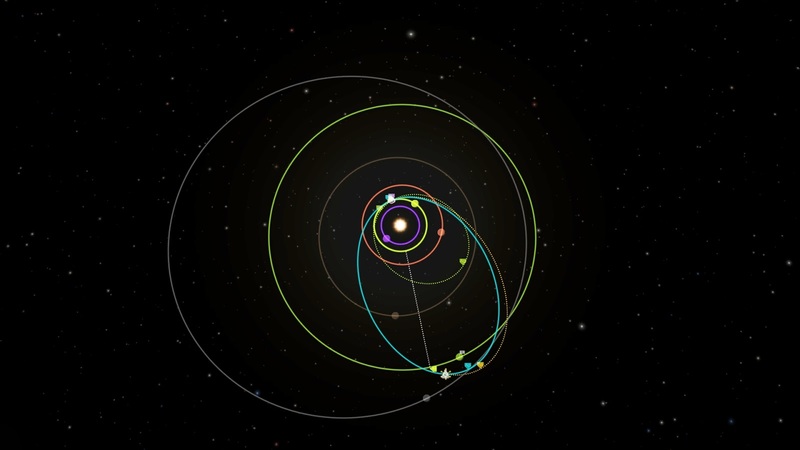 I already outlined my landing strategy in this post, which includes my precision deorbit simulation tool. 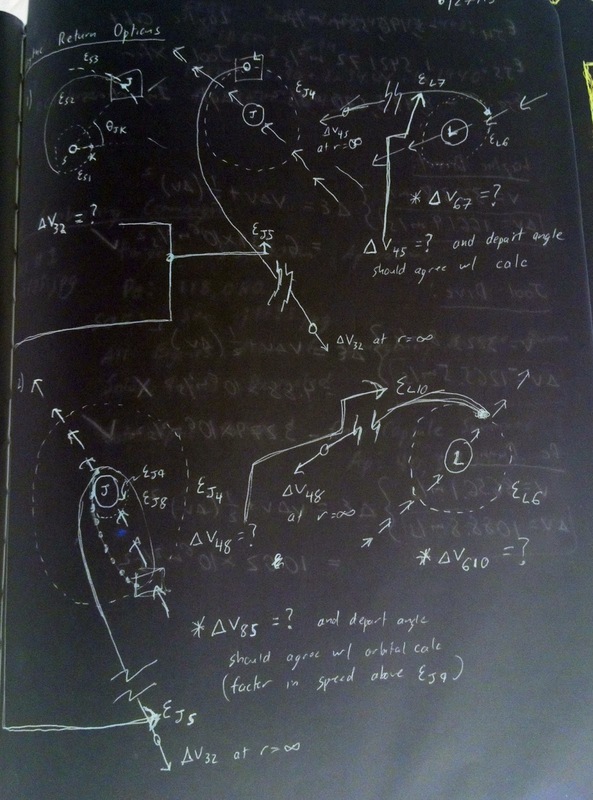 So here I can just review how it actually went. Actually, the deorbit tool worked perfectly - it was the ship design that was fundamentally flawed. 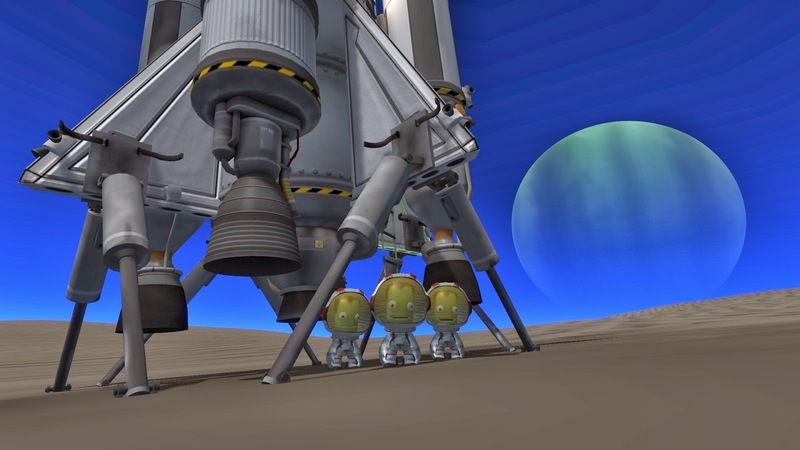 With full fuel, the lander is severely top-heavy and can only tolerate at most a 10-15º incline. 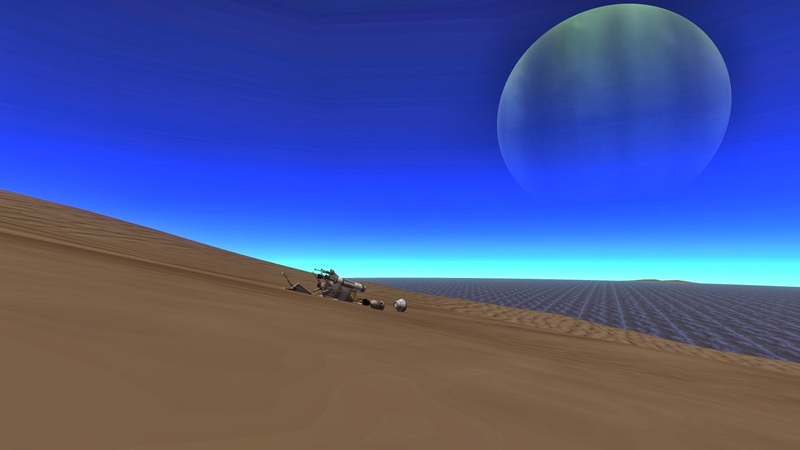 Lacking sophisticated tools such as ground slope radar and any spare fuel to make last-minute adjustments, the Kerbals really have no choice about where exactly they land, and even the flattest continents on Laythe are covered with fairly steep sand dunes. But, it's a damn water wold and I managed to hit land three times in a row. 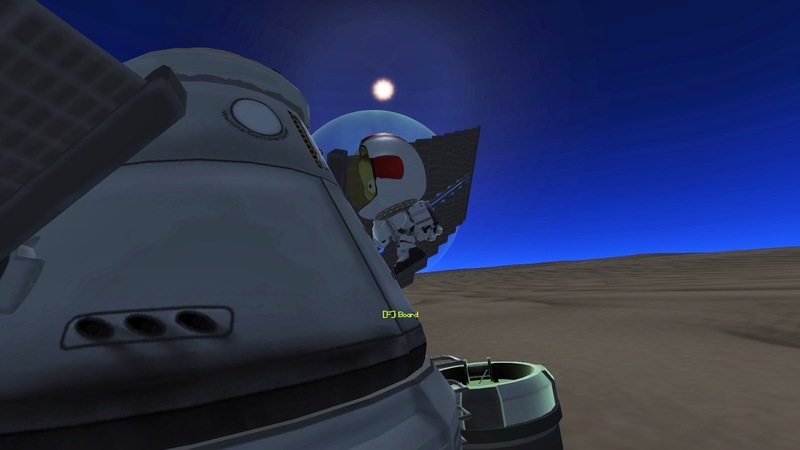 In all three cases, the Kerbals survived the landing, but in the first two attempts, the ship fell over and was destroyed. 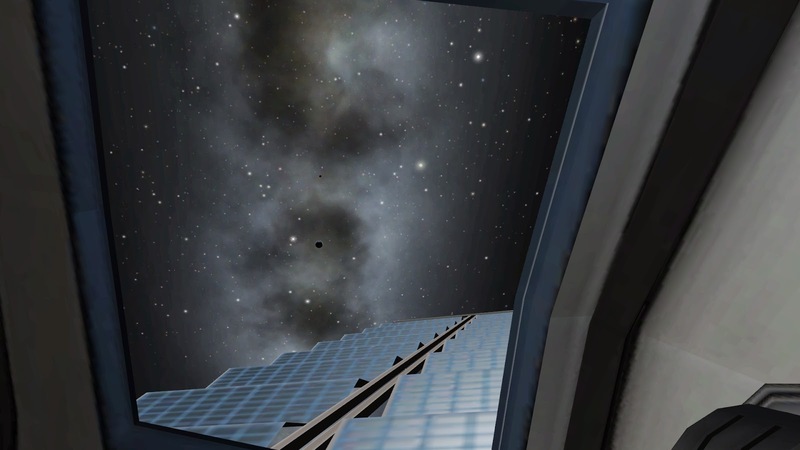 Rather than assigning the Kerbals colonial status, I used up two quicksave retries and finally stuck the landing on the third try. Other than the two tip-overs, landing went almost exactly as planned. 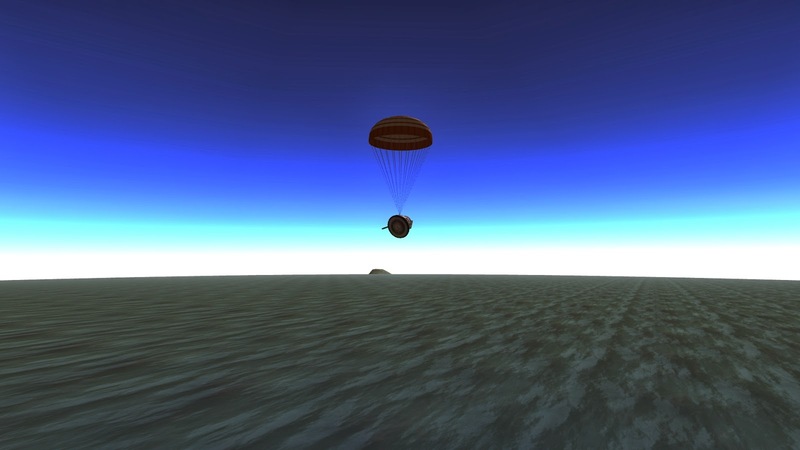 The deorbit tool provided an almost pin-point landing site prediction, the parachutes (drogues first, then main chutes) worked fine and slowed the lander to about 21m/s terminal velocity. The last quick burst of power to slow the ship to safe touchdown speeds was done from the in-cockpit view, so that I could look at the radar altitude and really be efficient with when to start the quick burn. 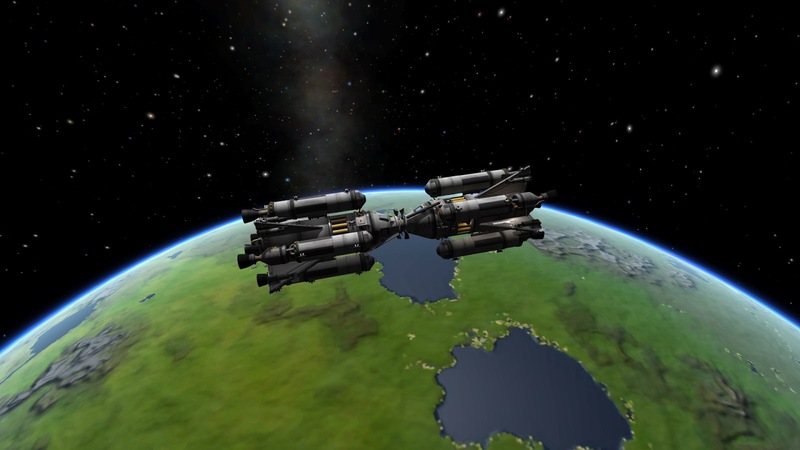 As a result, it used only 1.9 tons of fuel, about as good as my best practice runs on Kerbin. (I allotted for 2-3 tons to be used for deorbit and landing.) The remaining lander, still almost fully fueled, weighed in at about 56 tons. 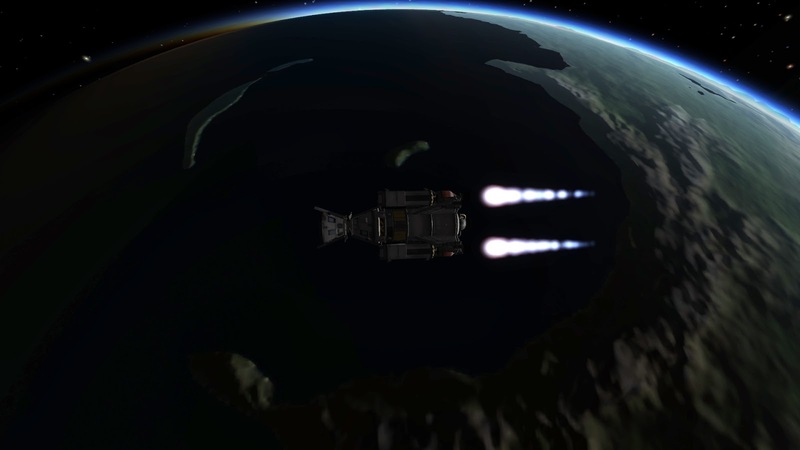 It truly is a behemoth of a landing craft, but that's what it takes to get three Kerbals back into Laythe orbit. Laythe ascent speed and altitude. 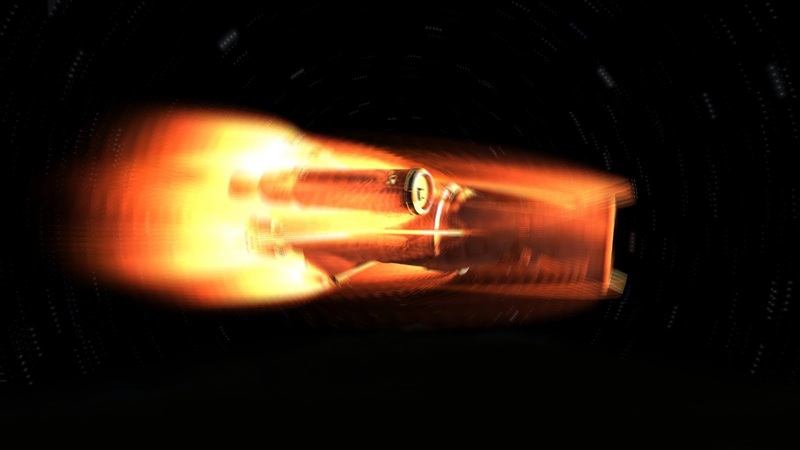 By the end of the ascent, 400 seconds after lift-off, the ship should be in a stable circular orbit, hopefully at or above 75km, with about two tons of fuel to spare. Or so the theory suggests. Time to try it out! Returning to the ship after one last look at the terrain. Nighttime launch. Stage 1: All five engines at nearly max power. Stage 2: LVT-30's and their fuel tanks are jettisoned, LV-N's and Poodle still firing. Stage 3: Poodle engine shutdown, LV-N's efficiently finishing off the circular orbit, into a beautiful sunrise. The two ships meet again. Val also making an appearance. I transferred all of the remaining fuel into one ship, the lander, which had already jettisoned its LVT-30's during its ascent from Laythe. Then, I cut loose the entire second ship, the orbiter, except for the command pod with its three Kerbals. This newly-lightened single return ship would have plenty of Delta-V, much more than two ships on their own would have had. As an added bonus, I only had to keep track of one ship during the trip back. 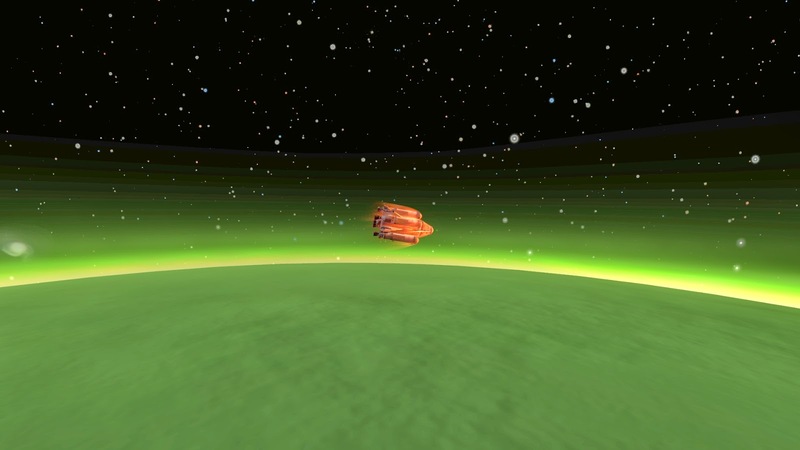 The down-side is I have left some space junk in Laythe orbit. 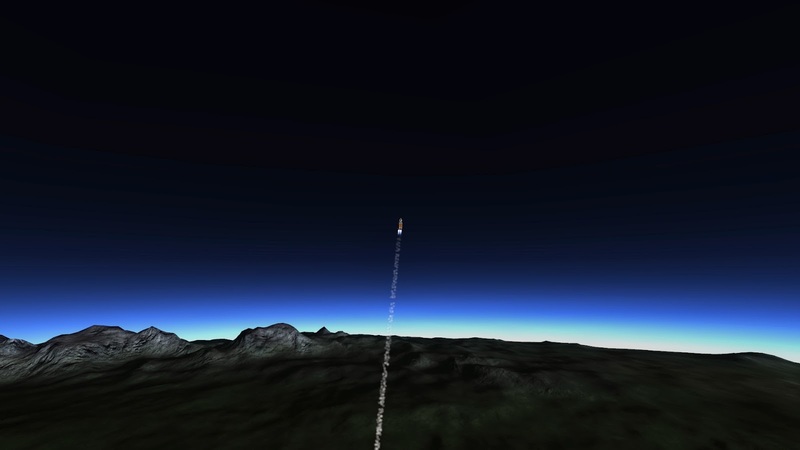 Exiting Laythe SOI parallel to its orbit. 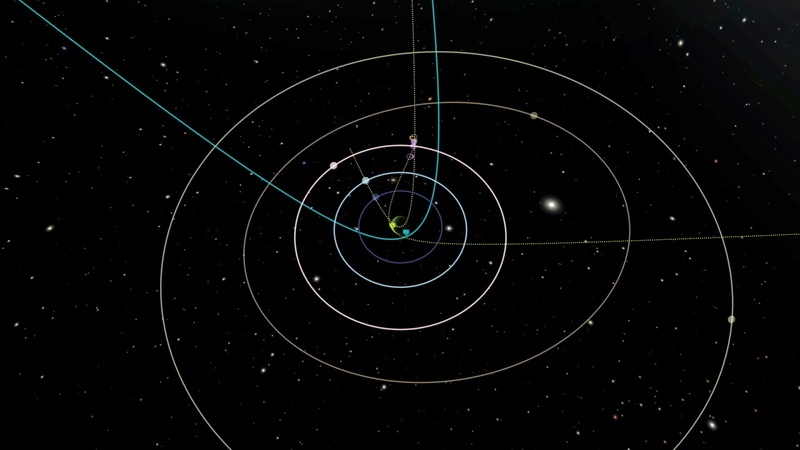 And with the correct Delta-V to get onto a Jool-Kerbin transfer orbit. Anyway, I royally screwed up the departure by trying to break up the burn into two parts. 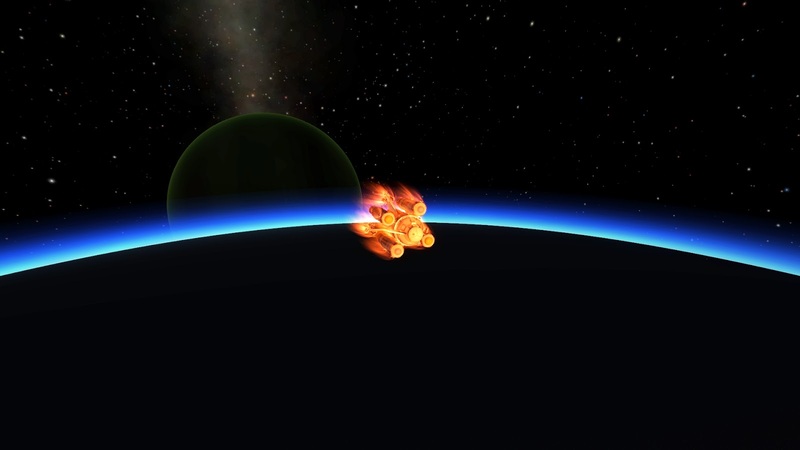 Burn #1, to a Laythe Ap of about 2,000km. 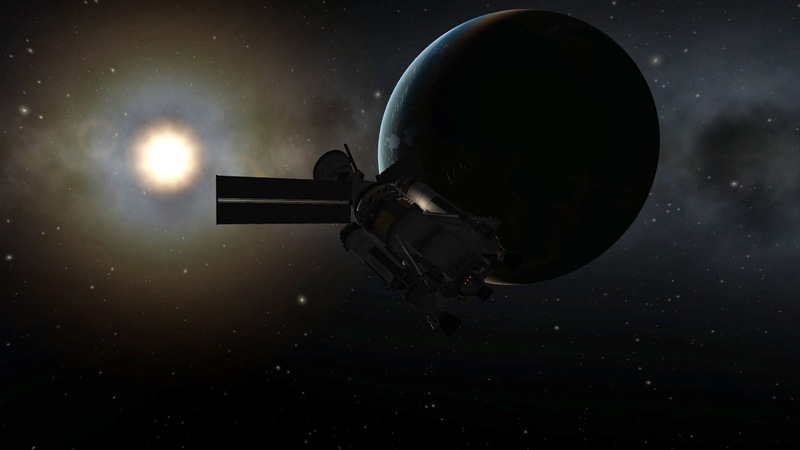 Very nice scenic route out, but I forgot how quickly Laythe orbits Jool. 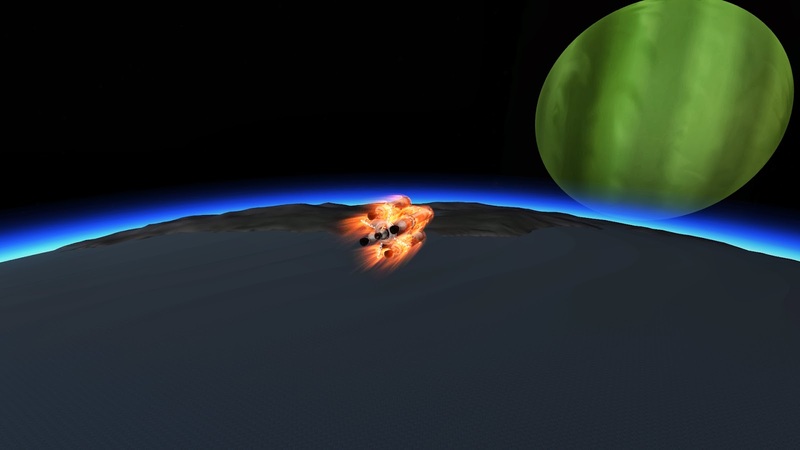 Burn #2...by now Laythe is way off the intended departure angle. 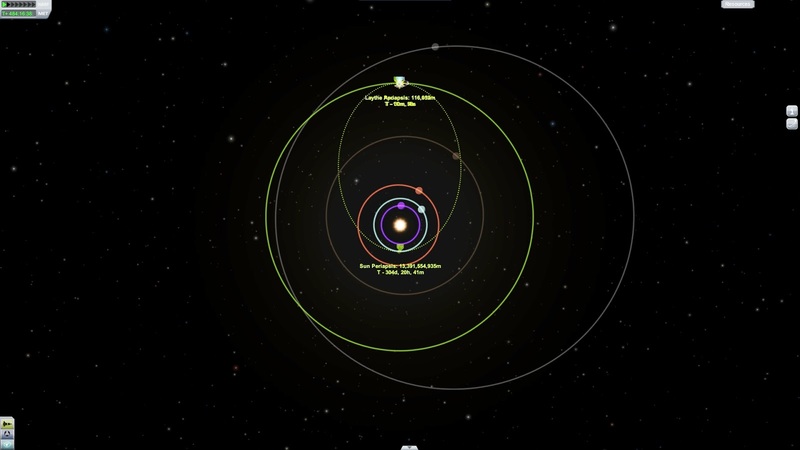 Far from parallel to Laythe's orbit = very inefficient. And the aerocapture worked well, ending with an apoapsis of about 1,000km (less braking Delta-V than prediced, but more than sufficient for capture). 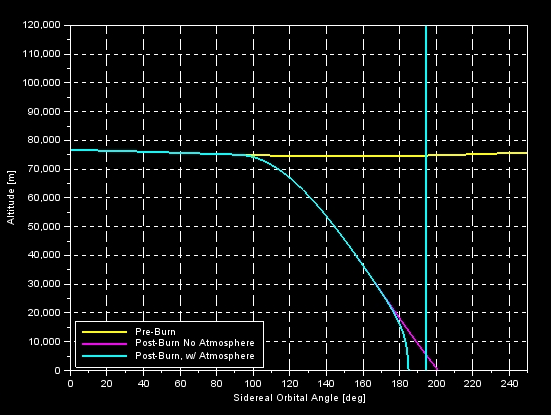 Further light aerobraking passes lowered the orbit of the combined ship to about 100km. The final step was to deorbit the command pods. I chose to do this one at a time. For one, I still wasn't very confident on the aerodynamic stability of the two-pod system. 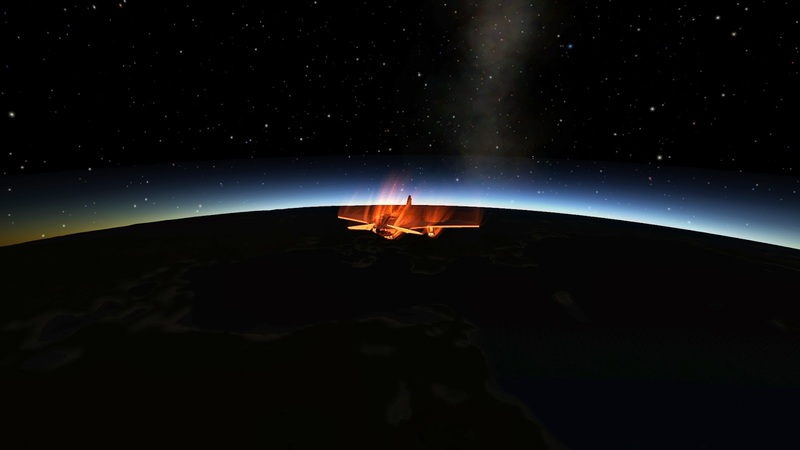 Doing one deorbit burn and then separating them was also out of the question: having two ships in the atmosphere at the same time usually leads to one disappearing forever. 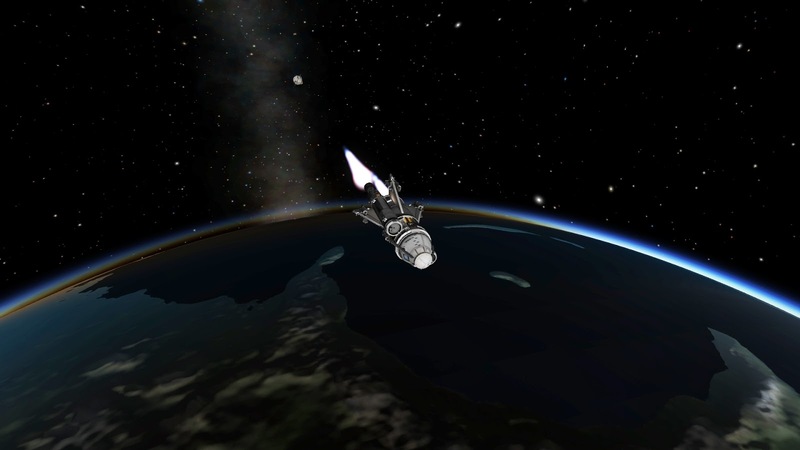 I had enough fuel left to deorbit one and then quickly turn around and put the remaining ship back into a parking orbit. 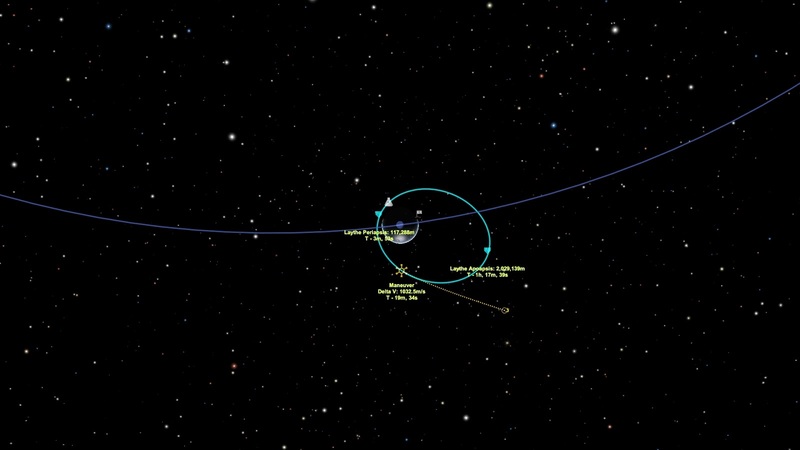 Step 1: Deorbit burn at the target crater. 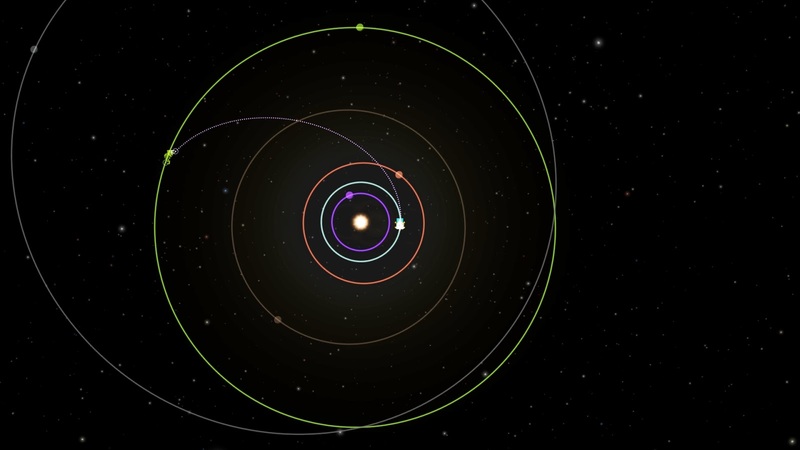 Step 3: Turn around and quickly get back into orbit. 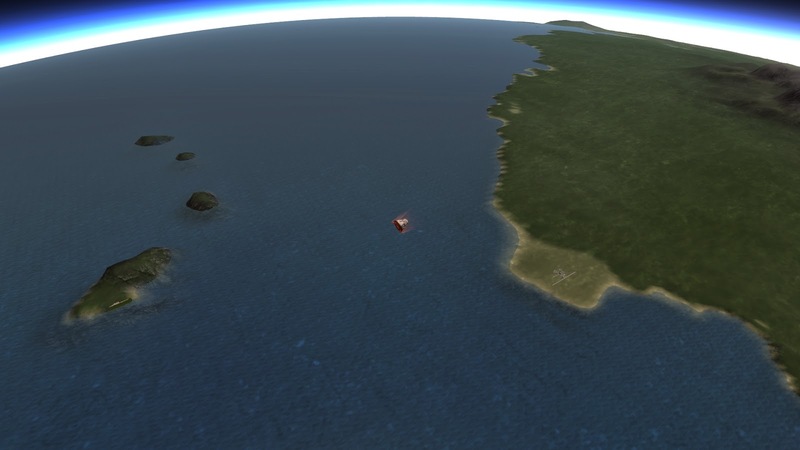 By now I have almost perfected Kerbin deorbit using my precision deorbit calculator and can pretty accurately target a landing just off the coastal location of the Kerbal Space Center. 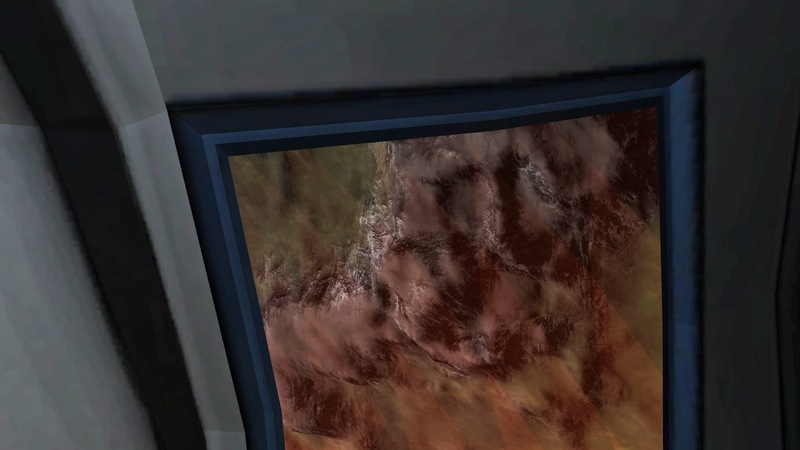 So ends a mostly-successful mission to Laythe surface and back using a ship that wasn't really designed for the task. 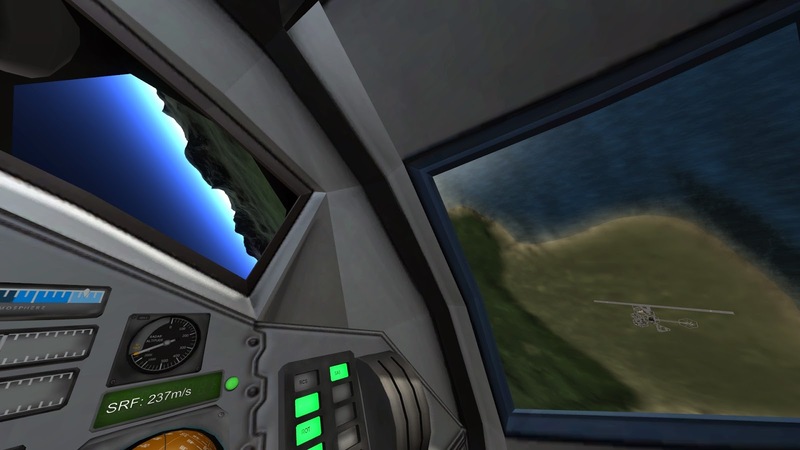 The technical parts of the mission, precision deorbits to hit what little land there is at Laythe and a first-attempt ascent, both went quite flawlessly based on the two simulators I made to assist. 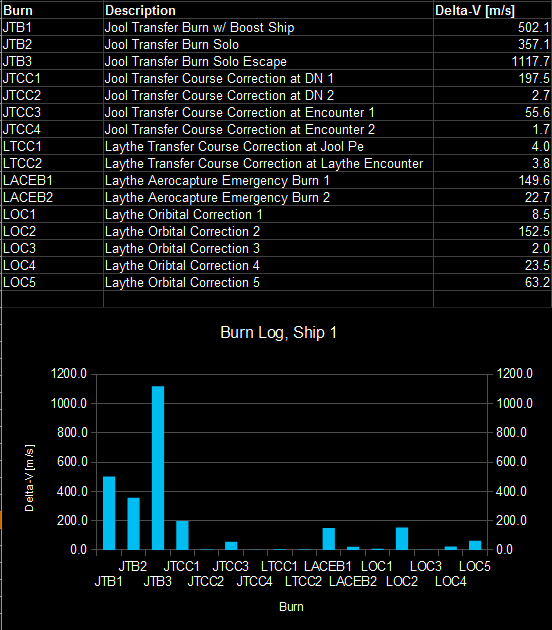 Transfers and aerobraking also went mostly well. The only real failure was the lander design itself - it's just too top-heavy to land on hilly terrain. Overall, while it is immensely fun to plan and execute a mission with such little margins for error in terms of fuel, it's also time-consuming and tedious sometimes. 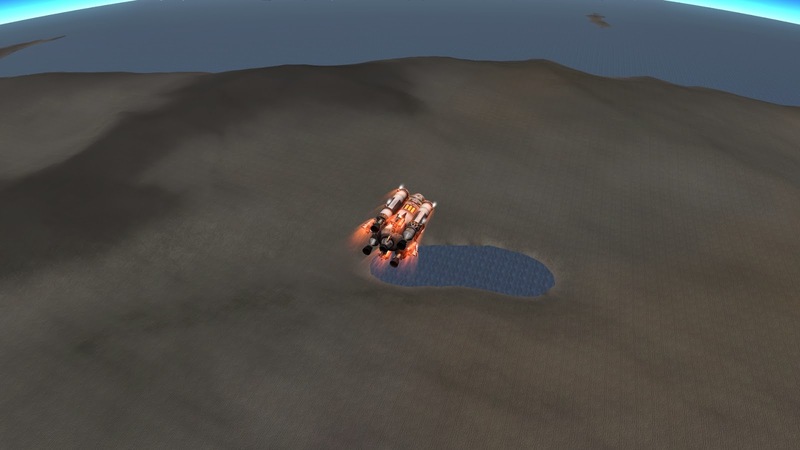 Additionally, even if the lander could tolerate steeper inclines, this method of Laythe landing restricts landing sites to a location somewhere on the equator within roughly a 5º margin of error from the deorbit burn. There's no opportunity for exploring the surface, or even landing two or more ships in the same place. Every bit of fuel is needed for the ascent, so powered or rocket-guided descents are out of the question. This was very entertaining. I skimmed over parts and will have to go back and read in more depth. Imagine if there were no quick saves! I could actually live with no quicksaves if there were also no bugs. But there are too many Space Kraken glitches to risk it right now. Maybe I should post the quicksave right before I landed (and tipped over twice) so other people can try out the landing! 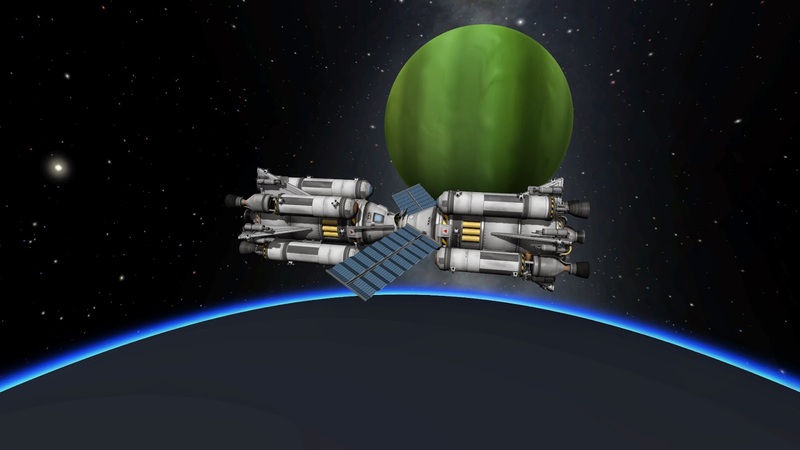 One thing I've not had a chance to play with is Tylo assist in getting into an out of the Jool system. I think it can save a ton of fuel, and/or save some hairy aerobraking. I will try it on my next big mission.